Vanessa Chaplow, from Hawke’s Bay explains the stigma she felt following her prediabetes diagnosis six years ago. She calls for a name change so people with the condition – and their doctors – take it more seriously. About six years ago I was having coffee with a friend who mentioned they were going for diabetes and cholesterol testing as she was feeling pins and needles in her feet and hands. I sat there thinking I have pins and needles in my hands and feet too, remembering back to when I was pregnant with my second child in 1990. During a routine pregnancy blood test the doctor informed me that I was now “predisposed to being a diabetic”. Unfortunately there was no further discussion or information given to me. I felt fine, and at the time it didn’t seem to be a problem, so I wasn’t worried. I didn’t realise back then how this gestational diabetes would come to impact on my future health. Vanessa was diagnosed with gestational diabetes 28 years ago but didn’t receive any information or ongoing monitoring despite being at risk of developing type 2 diabetes. After meeting my friend, I went to my GP asking for a diabetes test and explained why I wanted a test. I was informed that I was not fat enough to be diabetic. I had experienced a slight weight gain over the last few years but had suddenly lost the extra kilos without any diet or exercise changes (I now know why, it was because I was heading towards full-blown type 2 diabetes). My GP initially refused to test me as he believed there was no need, this resulted in an argument, and I got the blood test. A week later I was back for the results, suddenly I was too fat (same weight as last week, and wearing size 12 clothes) and drank too much alcohol (I don’t drink). The GP said I was prediabetic but gave me little information about what to do about it.When I learned that I had prediabetes I was extremely upset. I found out the hard way that I wasn’t going to get much support from friends and family, except for my children who were concerned. I felt like I had to deal with it on my own and struggled for a while. Some of the unhelpful comments included I was “pathetic going on a diabetic diet” that I don’t need to do anything as I’m “not on insulin and will be okay when I go on it” (this was from someone who doesn’t have diabetes). “It’s my fault for having a sweet tooth” and “there is no such thing as gestational diabetics” were other comments I had to put up with. I was determined to take action to improve my health so I learned about different foods and changed my diet. I switched to a new GP but when I went to them for my first blood test, my numbers had dropped. I was told that I didn’t have prediabetes and could eat a “normal” diet, so I did. I became tired and low in energy but had no idea why. In my job I receive ongoing external supervision and in a session I mentioned that I was tired and had no energy. I thought it might have been stress. I was asked whether I had felt like this in the past. I said no, and then thought a bit more about it. Oops, yes, I was like this before I was diagnosed with prediabetes (thank goodness my supervisor remembered). I went back for another blood test, and my blood sugars were higher than my initial blood test. So I learned that, no matter what my numbers say, I have to stick to a diabetes-friendly diet and look after myself. I would like to see the word pre removed from prediabetes, then perhaps GPs, people with prediabetes, and the wider community, will (hopefully) take it more seriously. I have found that if you tell people you are prediabetic they do not believe it’s serious, that you can still eat any type of food, that because you are not on medication it’s not a concern or problem. But I believe it should be treated in the same way as if you had type 2 diabetes. I now have six-monthly blood tests as I have found this supports me in maintaining my diet. I’m conscious of what I’m eating because I know a test is coming up, or I’ve just had one and I know what my blood sugars are doing. Being tested yearly is too long to maintain my diet without the motivation of aiming for low numbers. Clinically I am considered to have prediabetes but for people in my community to understand I say I have full-blown diabetes because of the lack of understanding that diabetes can be progressive. My goal is to avoid medication for as long as possible and I know this is only possible through diet and exercise. I would like to see the word pre removed from prediabetes, then perhaps GPs, people with prediabetes, and the wider community, will (hopefully) take it more seriously. 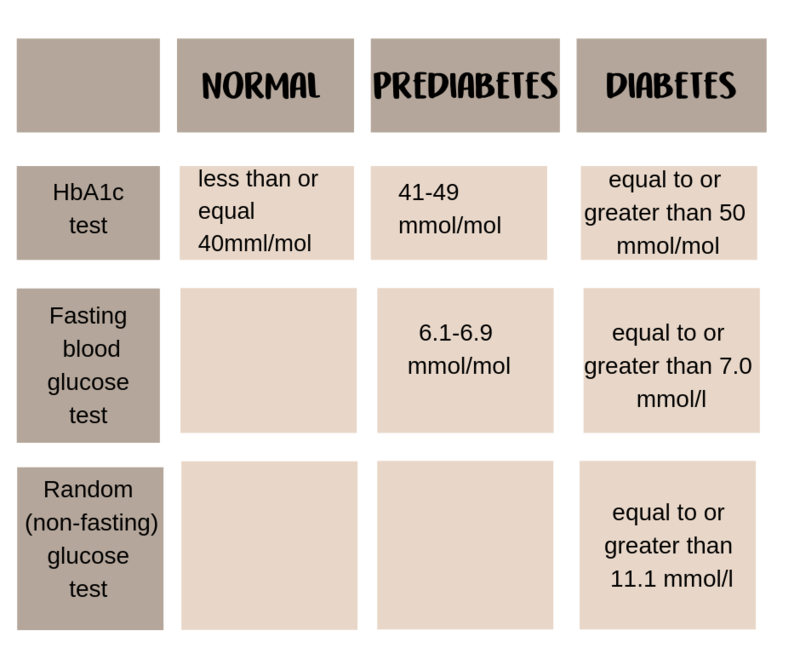 Prediabetes is when the amount of glucose (sugar) in your blood is higher than normal. This means you are at much higher risk of developing type 2 diabetes. In recent years the HbA1c test has become the preferred test for screening and diagnosis of diabetes and prediabetes. It reveals the average amount of sugar in your bloodstream over the previous eight to 12 weeks and is more accurate than a one-off urine test.